Set free he travels, not pursuing or going. On the twentieth the arch-sacrificer Methodios was slain by the sword. 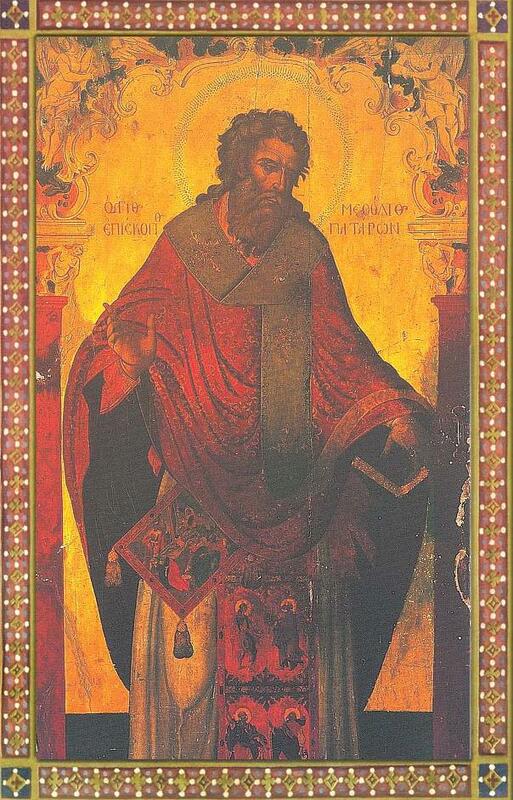 Saint Methodios at first was a Bishop of Olympus then a Bishop of Patara, both in the Lycia region of Asia Minor. 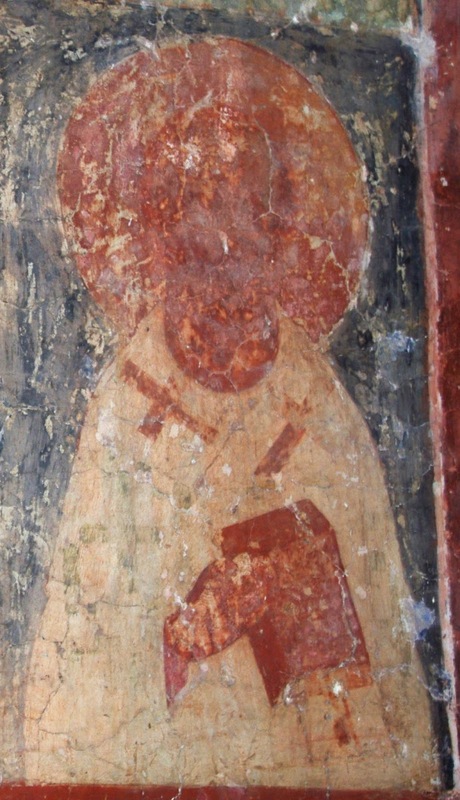 Saint Jerome adds that he also became the Bishop of Tyre, though this may not be likely. As a learned and eloquent hierarch, Methodios was the first who wrote against the heresies of Origen. He left behind him a rich literary legacy: works in defense of Christianity against paganism, explications of Orthodox dogmas against the heresy of Origen, moral discourses, and explanations of Holy Scripture. 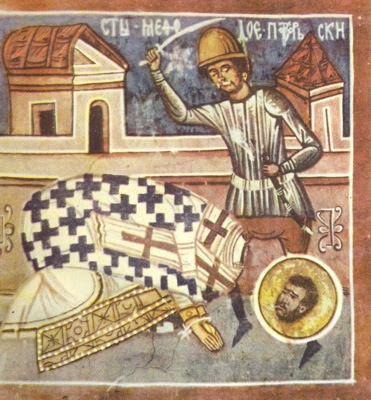 The pagans rose up against him, tortured him and beheaded him in Chalcis in Syria around the year 311. Though the defenders of Origen, like Socrates the historian and perhaps Eusebius of Caesarea who did not mention him, were unfavorable towards Methodios, most of the Church Fathers spoke highly of him. 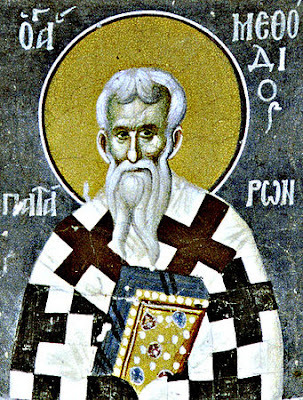 Epiphanios of Salamis calls him a "blessed man", and afterwards gives him the character of a learned or eloquent man, and a zealous defender of the truth. Jerome lists him among the illustrious men, and calls him "the most eloquent martyr Methodios". Andrew of Caesarea often cites him in his Commentary on the Apocalypse and calls him the "great Methodios", "blessed man", and "holy". Eustathios of Antioch says that he was "worthy of holy memory". Like Origen, he was strongly influenced by Plato's philosophy, and used to a great extent the allegorical explanation of Scripture. Of his numerous works only one has come down to us complete in a Greek text: the dialogue on virginity, under the title Symposium, or on Virginity and also known as the Banquet of the Ten Virgins. In the dialogue, composed with reference to Plato's Symposium, he depicts a festive meal of ten virgins in the garden of Arete (Virtue), at which each of the participators extols Christian virginity and its sublime excellence. It concludes with a hymn on Jesus as the Bridegroom of the Church. Larger fragments are preserved of several other writings in Greek; we know of other works from old versions in Slavonic, though some are abbreviated. 1. On Free Will, an important treatise attacking the Gnostic view of the origin of evil and in proof of the freedom of the human will. 2. On the Resurrection, in which the doctrine that the same body that man has in life will be awakened to incorruptibility at the resurrection is specially put forward in opposition to Origen. 3. On Life and Rational Action, which exhorts in particular to contentedness in this life and to the hope of the life to come. 4. On the Jewish Dietary Laws, and on the young cow, which is mentioned in Leviticus, with allegorical explanation of the Old Testament food-legislation and the red cow (Num. 19). 5. On Leprosy, to Sistelius, a dialogue between Eubulius (Methodius) and Sistelius on the mystic sense of the Old Testament references to lepers (Lev. 13). 6. On the Leech in Proverbs (Prov. 30:15) and on the text, "the heavens show forth the glory of God" (Ps. 18:2). Of other writings, no longer extant, Jerome mentions (On Illustrious Men, Ch. 83) a voluminous work against Porphyry, the Neoplatonist who had published a book against Christianity; a treatise on the Pythonissa directed against Origen, and commentaries on Genesis and the Song of Songs. Other authors attributed a work On the Martyrs, and a dialogue Xenon to Methodios; in the latter he opposes the doctrine of Origen on the eternity of the world. 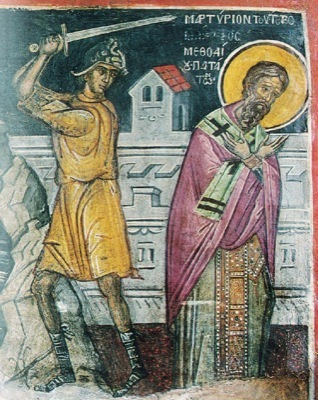 The 7th-century Apocalypse of Pseudo-Methodius is falsely attributed to him. Thy blood, O wise Methodios, cries to God from the earth like the blood of Abel. O holy Martyr, thou didst preach Christ's incarnation, and defeat the false doctrines of Origen. Thou hast entered the heavenly bridal chamber: Pray to Christ our God that our souls may be saved. 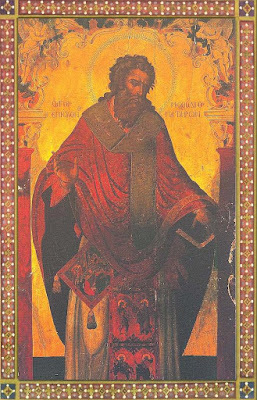 O Priest and initiate of the Holy Trinity, preacher of Divine commandments, and support of the Orthodox, thou didst expose the errors of false doctrine, and shed thy blood as a martyr for the faith. O Methodios, standing before Christ with the angels, pray that we may be saved.